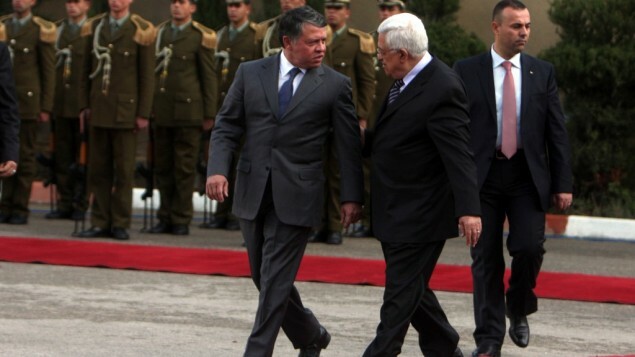 AMMAN (JT) – His Majesty King Abdullah on Thursday reiterated that the two-state settlement of the Palestinian-Israeli conflict and the establishment of an independent, viable and sovereign Palestinian state living side by side with Israel is the only way for a comprehensive regional peace. In remarks at the Plenary Session of the 65th General Assembly of the United Nations in New York, where he headed the Jordanian delegation, His Majesty said that the alternative to such a comprehensive peace is “more suffering, deeper frustrations” and the spread of more vicious warfare. “Such a catastrophic scenario will continue to drag in the whole world, threatening security and stability far beyond the borders of the Middle East,” he told the world gathering (see full text of speech). In the speech, the King pointed to a resolution Jordan proposed to the General Assembly related to the introduction of an annual World Interfaith Harmony Week. “What we are proposing is a special week, during which the world’s people, in their own places of worship, could express the teachings of their own faith about tolerance, respect for the other, and peace. I hope this resolution will have your support,” he said. Also on Thursday, the King discussed with Lebanese President Michel Sleiman the latest regional developments, the Royal Court said in a statement. The two leaders addressed efforts exerted to achieve Middle East peace, regain Arabs’ rights and ensure the establishment of an independent Palestinian state. King Abdullah and the Lebanese president discussed several regional and international issues and ways to deal with them in a manner that serves both countries’ interests as well as joint Arab causes. Stressing the strong Jordanian-Lebanese relations, the two leaders also examined steps needed to activate economic cooperation. King Abdullah stressed the Kingdom’s support for Lebanon’s efforts to foster its security and stability, the statement added. The Monarch also met with Canada’s Prime Minister Stephen Harper. Discussions focused on the latest developments regarding efforts exerted to achieve progress in the Palestinian-Israeli direct negotiations, which were launched in Washington at the beginning of this month. The King and Harper also reviewed Jordanian-Canadian relations and means to enhance them, especially in the fields of economy and investment. Earlier on Thursday, the King attended an official lunch banquet hosted by UN Secretary General Ban Ki-moon, in honour of different heads of states and delegations participating in the UN General Assembly meetings. On the sidelines of the UN meeting, Minister of Foreign Affairs Nasser Judeh on Thursday underscored the importance of creating appropriate conditions for the success of the ongoing direct Palestinian-Israeli negotiations. During a meeting in New York with his German counterpart, Guido Westerwelle, Judeh briefed Westerwelle on the intensive political activity King Abdullah is undertaking to achieve peace in the region. He highlighted the need to intensify international efforts to achieve the needed progress as soon as possible to end the Palestinian-Israeli conflict on the basis of the two-state solution and according to the adopted terms of reference, guaranteeing the establishment of an independent and viable Palestinian state based on the 1967 borders with Jerusalem as its capital, to live side by side with Israel in peace and security. Judeh said Germany plays an important role in the European Union and the international community in pushing peace efforts forward to end the conflict in the region, particularly the Palestinian-Israeli conflict, which he reiterated is an issue of international concern. Westerwelle stressed his country’s determination to push efforts forward to achieve peace and stability in the Middle East based on the two-state solution and according to the adopted terms of reference. Discussions also covered means to enhance bilateral relations in all fields.